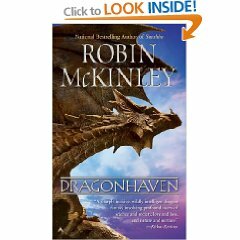 Dragonhaven is one of Robin McKinley’s latest twists on fantasy. In this book, the main character Jake is the son of the Smokehill Institute Director. Smokehill is a national preserve- for dragons. Dragons are real as wolves and bears, and have attacked less humans than the other predators, but are still wanted by the human government. Jake describes the Institute’s troubles with money and the government, as well as his own troubles raising a dragonlet- which is illegal. As he is doing this, the Instutite is under extreme pressure, because the dragonlet’s mother was killed by a poacher- and killed the human poacher, inciting more trouble against Smokehill. The entire book was a page-turner; between the issues with the Instutite and Jake’s records of raising his dragonlet, which he knows nothing about. Anyone interested in fantasy will like this book, but so will other readers.